The erosion behavior at room temperature of as-deposited suspension plasma spray (SPS), electron beam physical vapor deposition (EB-PVD) and air plasma spray (APS) ZrO2-Y2O3 (YSZ)-based TBCs was investigated. All coatings were deposited on Inconel 625 alloy coupons. The same APS CoNiCrAlY bond coat was employed for all SPS and APS TBCs. The erodent material was 50-µm alumina, and the impact angles were 15° and 90°. A total of 4 different types of SPS YSZ-based TBCs were tested, which consisted of two distinct columnar-segmented and two distinct columnar-grown microstructures. The EB-PVD and APS YSZ TBCs were employed as benchmarks. The erosion performance of the different TBCs in this study was ranked based on the coating volume loss after wear testing. The TBC microstructures and phase compositions were evaluated via scanning electron microscopy and X-ray diffraction. The erosion mechanisms of the different TBCs were compared by analyzing the cross-sectional and top surface microstructures of the as-deposited and eroded TBCs. These are released results from the Surftec Industrial R&D Group of the National Research Council of Canada. 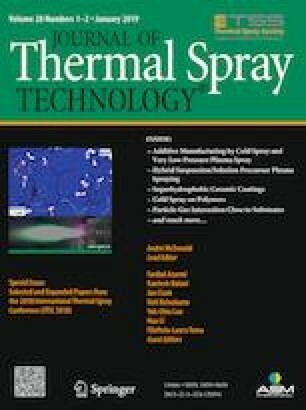 This article is an invited paper selected from presentations at the 2018 International Thermal Spray Conference, held May 7-10, 2018, in Orlando, Florida, USA, and has been expanded from the original presentation. The authors would like to acknowledge the outstanding contribution of Northwest Mettech for providing the two 8YSZ SPS TBCs and Arconic for providing the EB-PVD 8YSZ TBC benchmark. These results are based on the Surftec reports presented in 2012. The authors also would like to acknowledge Dr. Weijie Chen, for coordinating the erosion testing results at the NRC Ottawa site.